Not all Computer Science inclined students are pursuing a career in Computer Science. At least not exclusively. An interesting point came out of just such a discussion. As much as computer programming could be argued to be an art, when it competes for the interest against more conventional styles of artistic expression – it leaves students confused. For me, well… I have two things I want to do right now… but I don’t which one I really want to do. I really like to program but I really like to play music. I have good grades in both classes, both marks are about the same. Maybe I’ll pursue both and become a Programming Musician, or something like that. 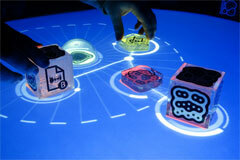 Back then, I’ve pointed out Reactable – a multitouch table top that is described as “a kind of tangible modular synthesizer or graspable flow-controlled programming language”. At the time I thought that all of this technology, software, and user interfaces, would be as close as computer programming would come to the domain of music. I should have been pointing to Craig Latta – a composer and a computer scientist. TOPLAP exists to promote the writing and modifying of rules while they are followed. This includes the writing of software while it is being executed, allowing programmers to improvise music and visuals live before an audience as well as conduct exploratory research with live source code. Apparently Craig does Code-Writing as Performance Art, and I’d love to attend his “musical livecoding” performance in Smalltalk. Meanwhile I managed to find a sample of Alex McLean’s livecoding session in Haskell. So there it is – one could become a “Programming Musician, or something like that”.